The facial reconstruction images of John Doe # 10, left, and John Doe # 13, two of John Wayne Gacy’s victims. New images of two unidentified victims of serial killer John Wayne Gacy were released Monday as authorities continue efforts to identify all of the infamous murderer's victims. 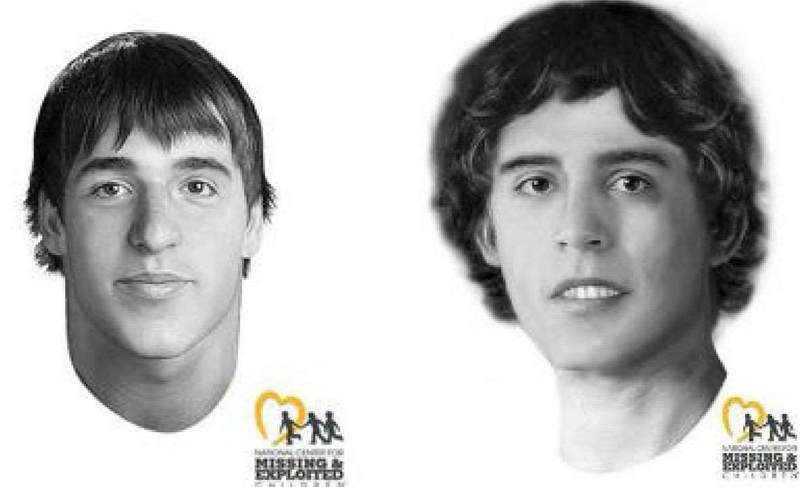 The National Center for Missing & Exploited Children and the Cook County, Ill. Sheriff’s Office released new facial reconstructions of the two victims. NCMEC worked with the sheriff’s office to make the images of what the victims -- known as John Doe #10 and John Doe #13 -- may have looked like. [post_ads]John Doe #10 was determined to be a white male between 17 and 21 years old. He was about 5-7 to 5-11. His hair and eye color was not immediately clear. Before his death, his left clavicle was injured and healed over time. Authorities believe he died between 1972 and 1978. John Doe #13 was determined to be a white male between 18 and 22 years old. He was between 5-9 and 6-2 with dark brown hair and upper tooth that was displaced. Authorities said his tooth may have been noticeable to people who knew him. Authorities believe he also died between 1972 and 1978. NCMEC and the Cook County Sheriff’s Office have asked anyone with information on the victims to come forward and contact them. "Hopefully, based on that reconstruction, or that approximation, we'll get some more leads," Det. Sgt. Jason Moran of the Cook County Sheriff’s Office said. Gacy, a Chicago-area building contractor, lured young men to his home by impersonating a police officer or promising them construction work. There, he stabbed one and strangled the others. He buried most of them in the crawl space and dumped others in a river. Gacy is regarded as one of history’s most unconventional killers, largely because of his work as an amateur clown. Gacy was also considered an active citizen of the community and well-liked by the town’s residents. He was convicted in 1968 of sexually assaulting two teenagers, but it is believed that Gacy killed his first victim, teenager Timothy McCoy, in 1972. In 2011, Cook County Sheriff Tom Dart ordered the victims’ bodies exhumed and asked relatives of the young men who vanished between 1970 and Gacy’s 1978 arrest to submit saliva samples in order to compare their DNA with that of the victims. Dart hoped the advances in scientific technology would help investigators identify the eight victims. Since then, two more victims were identified – William George Bundy, 19, and James Byron Haakenson, 16.